We have come to the end of our series. A series that began comparing our worship of God with a parasol, or umbrella. Why? Because just as a parasol, or umbrella, is used as a protective covering, so too is our worship. In our second article, we learned about how it is the ribbing of a parasol, or umbrella, that provides the canopy with sustained form and the ability to protect the user from the elements. 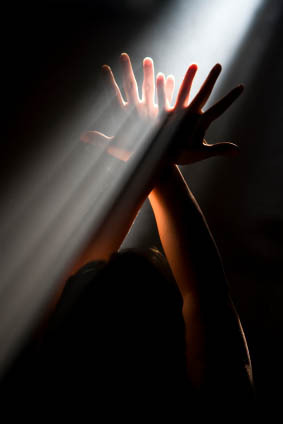 Our worship must also be reinforced in like manner, so that our acts of our worship are properly sustained and you, the worshiper, are also provided with adequate protection from various spiritual elements. Article 3 finds us acquiring knowledge of the stretchers and runner. The purpose of these two implements, is to allow the user to extend the gadget’s ribs and expand its canopy to full capacity. Once the runner is locked into place, the stretchers also provide the final element of support needed for this tool to be used comfortably and correctly. In similar fashion, it is the Holy Spirit Who is the divine implement that connects our attitude, or spirit, of worship to the truth of God’s incarnate Word — Jesus Christ. In our fourth article, we talked about the canopy and how it represents our godly acts of worship. You see, our acts of worship are a divine covering meant to benefit us and make a way for us to serve others. 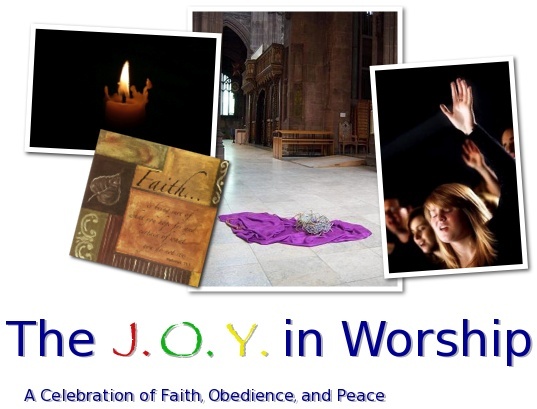 Our acts of worship also display our devotion to God, affecting our overall behavior. This allows us to become active participants in doting on, and glorifying our Creator. In Article 5 we took time to gaze upon the most easily overlooked portion of our “parasol of true worship” — the top tube. Why was that small piece so important? Because it represents something that too many of us wrongly take advantage of — the grace of God the Father. 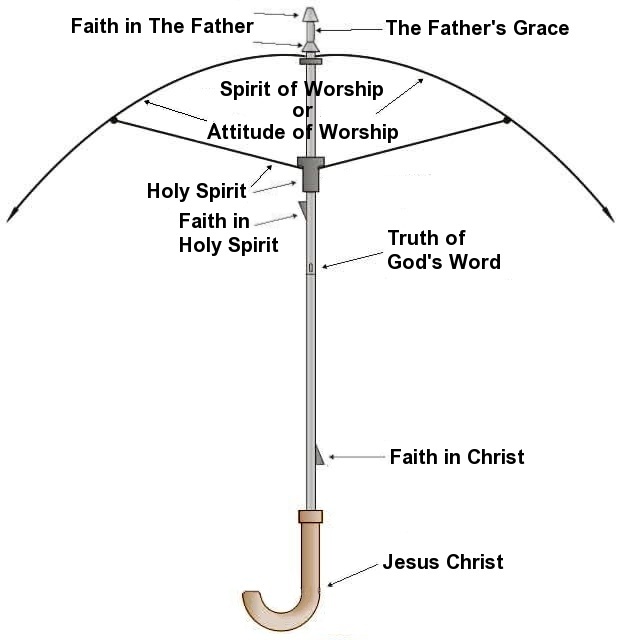 Take the time to know how important the top tube is to our “parasol of true worship,” and learn just how majestic and marvelous God’s gift of grace is to humanity. And in our final article, we learned about the ferrule, open cap, and triggers. You see, the ferrule sets at the very top of the tube, and its basic function is to act as a protective cap, while it is the open cap that sets just a few inches below it and keeps the top of the canopy in its place. The open cap also allows for tension on the ribs when the canopy is fully expanded. 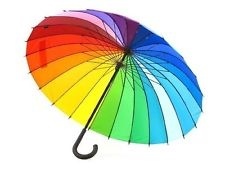 And lest we forget, it is the triggers that allow the parasol, or umbrella, to open and close. The significance of these final three components to our worship is summed up in one word — “faith.” Without faith, believers could not be certain of their future — a future based on the promises of God. So the next time you reach for your parasol, or umbrella, take time to reflect on these various implements. Take the time to consider how they represent certain aspects of your worship. Doing so will allow you to understand more completely how to linger in God’s presence, better endure your hardships, and shine the light of God’s divine love to this lost and dying world that we all live in. 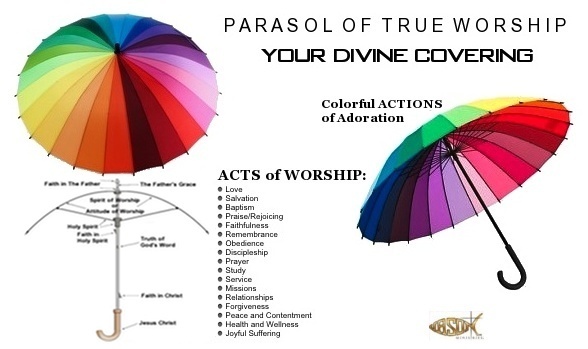 So take hold of your “parasol of true worship” . . . open it up . . . and make use of its colorful and varied substance; may God’s blessings be upon you. Parasol of True Worship: Your Divine Covering by J.Scott Harden is licensed under a Creative Commons Attribution-Noncommercial-No Derivative Works 3.0 United States License. Based on a work at jasonmin.wordpress.com. Permissions beyond the scope of this license may be available at http://www.jsnmin.org/.